There is only one canopy that is safe, secure and strong – A SMM steel Canopy! Choosing the right canopy can be just as challenging as picking the vehicle itself, with the range of models, styles, and options overwhelming at times. Only SMM Steel canopies provide maximum strength, durability, security, maximum payload and the benefit of being environmentally friendly. The Sammitr Group has over 50 years of experience within the automotive industry, providing you with the confidence that SMM are the trustworthy choice when it comes to installing a canopy on your motor vehicle. The SMM range of steel canopies is made with the most up-to-date automotive manufacturing processes that ensure quality is built in. All SMM canopies are made from high-quality automotive steel and are designed for maximum strength, durability, and security. The team here are committed to providing you with the highest quality of products and service to see your vehicle drive further. We also stock a great range of SMM 4×4 accessories so you can enhance your vehicle to your specific needs, as well as a range of roof racks including exclusively designed SMM Roof Racks by Milford. 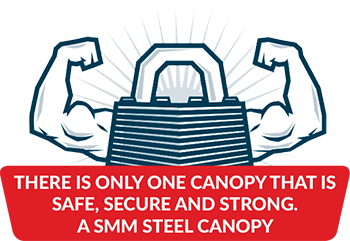 We guarantee peace of mind with a full 3-year warranty on the SMM Canopy range.